In freshman dress Robert Nishiyama wears a maroon "dink" with his class numerals, a maroon knitted tie and a pin with his name on it. He carries matches with which he must light the upperclassmen's cigarets. He must also allow seniors to precede him through doors. Like all freshmen, he is supposed to do this until Christmas vacation. 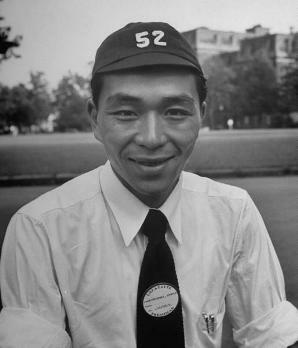 Robert Yukimasa Nishiyama, a former Japanese Navy pilot in the Kamikaze Special Attacks Corps, became the first Japanese person to attend an American university after the end of World War II . The five-page article with 14 photographs published in the fall of 1948 in Life magazine focuses on his arrival and reception at Lafayette College in Pennsylvania but provides almost no details on his life as a Navy pilot. One photograph shows Nishiyama's "cadet class in the summer of 1944 posed in front of cadet quarters," but the caption and article do not give any more details regarding his Navy experience other than that he ended the war still waiting for orders to make a suicide attack on American ships. Nishiyama received a scholarship that had been established with $10,000 from a life insurance policy on Robert Johnstone, who had died fighting in Luzon in May 1945 as part of the U.S. Army. The Life article indicates that the establishment of a scholarship to assist Japanese students was the dying wish of Robert Johnstone, but actually it was not his dying wish since his father convinced the rest of the family to establish a tuition scholarship in his memory at Lafayette College, where Robert had attended for six months as an engineering student prior to being drafted into the Army . 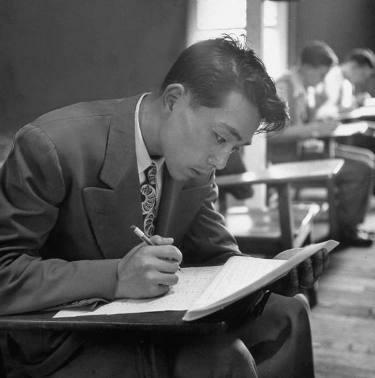 The scholarship was established in the fall of 1945 for a Japanese student, but Occupation authorities in Japan did not allow Japanese to travel overseas right after the war's end, so Nishiyama, as the first student from Japan to attend an American university after the war's end, did not did not enter Lafayette College until the fall of 1948 . When Nishiyama was drafted into the Japanese Navy, he was in his third year of studies of English at the Tokyo Foreign Language University. He was married to Helen Matsuoka, who had grown up in California although she had been born in Japan, and she had graduated from Stanford University just prior to the start of the Pacific War . After the war Nishiyama worked as translator for the American military in Korea. He entered Lafayette College in the fall of 1948 when he was 22 years old, and a former Marine named Lew Bender, age 26 at the time, asked to be his roommate. The college agreed since they were both older than average age. Nishiyama graduated from Lafayette College and returned to Japan, where he had a successful career in business. From 1962 to 1985, he served as president and general manager for the Japanese subsidiary of a U.S.-based electronic components manufacturer. He then worked as marketing vice-president for the Pacific Basin of another U.S.-based electronics company . The scholarships no doubt benefited individual Japanese, but instead of fulfilling their stated mission to promote pro-American sentiments in Japan, these programs were more effective in allowing some earnest Japanese individuals to show their people in a better light. 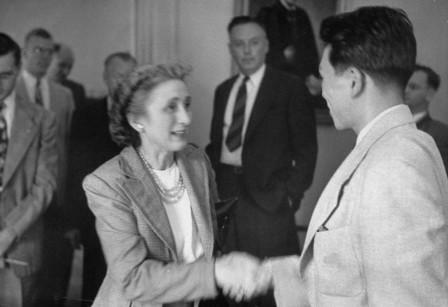 Rather than spreading good news about America in Japan, the students helped Americans accept the Japanese as their "junior allies" in the Far East. Only a sample of photographs from the original article have been included on this web page. A little more than three years ago Ensign Robert Yukimasa Nishiyama, 19, pilot in the Kamikaze Corps of the Imperial Japanese Navy, was awaiting orders to go out and crash his explosive suicide plane into a U.S. warship. At about the same time Private Robert Stansbury Johnstone, 18, a U.S. soldier in the Philippines, had a premonition of death. He wrote home and asked his parents to use his $10,000 government insurance to establish a scholarship which would teach his enemies the American way of life. Shortly thereafter Johnstone was killed by a Jap during the fighting on Luzon. And last week Robert Nishiyama, whose country had surrendered before he was sent on a mission, showed up at Lafayette College in Easton, Pa., as a student on the scholarship which Johnstone's money made possible. "Welcome, welcome, we're so glad you're here at last." Nishiyama had been one of 20 Japanese applicants for the Johnstone scholarship. A foreign-language student in Tokyo, he speaks English very well and impressed the scholarship board by his perfectly written letters. When he got to the Lafayette campus he went to the president's office to meet Private Johnstone's family. He stood around nervously until the Johnstone family came in. Mrs. Johnstone quickly ran up and welcomed him, followed by Mr. Johnstone and their younger son Bruce, a Lafayette freshman who towered over Nishiyama. "Bob," Mrs. Johnstone said quickly, "was almost as tall as Bruce is." Moved by the meeting, Nishiyama could only say to each of them, "I don't know how to thank you." Then, with new roommate, Lewis Bender, an ex-Marine who is studying to be a minister, Nishiyama went off to sign the papers, take the tests and buy the "dinks" that go with every freshman's first college days. test. He was embarrassed when it had to be explained. Nishiyama was prepared for almost anything but the casual reception he got from Lafayette classmates. He had learned something of the U.S. from his wife, who had lived here most of her life and had graduated from Stanford University, and from U.S. soldiers for whom he had worked as interpreter. In spite of this he expected to find some bitterness and some people who would blame him for the war. But his classmates were friendly and paid little attention to him. He walked hesitantly into Easton to buy a pair of sneakers and found that the storekeepers, who had heard of him, were very pleased to see him. He walked back, and a sophomore took him to dinner. Then, suddenly, he found he was just one of 500 confused freshmen going through an indoctrination program. He bought books. He met his adviser. He selected his courses, signing up for American history, English and French. When he graduates he wants to go back to Japan and, in the spirit of Johnstone's scholarship, teach international relations. in 1944, weighed 170 pounds, has lost 35. Lafayette College has a web page entitled "Japanese Ex-Kamikaze Pilot Attended Lafayette" about Yukimasa Nishiyama. 2. Shibusawa 2006, 185, 191. 9. Shibusawa 2006, 201, 203. Shibusawa, Naoko. 2006. America's Geisha Ally: Reimagining the Japanese Enemy. Cambridge, MA: Harvard University Press.